I want them forever and ever. that removed the danger of Pattar? that soothe the pains of your devotees? 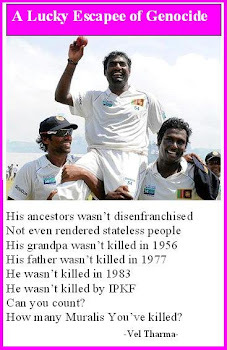 Innocent Tamils are being killed everyday. He was killed in temple. Terrorists are not those who live their life for others. 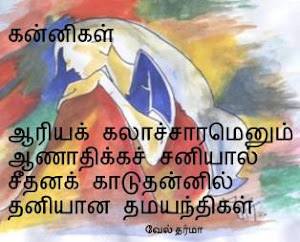 யுத்தமே எமைச் சேர்த்தது! யுத்தமே பிரித்தது! பின்பும் தேடியலைந்தேன் குடும்பமே வெளிநாடு சென்றதாம். டெல்லியில் தமிழனை அழிக்கிறான் பாராய் பாராய். Are you the Srilankan Army? Am I an innocent Tamil baby? Am I an innocent Tamil child? Are you the Srilankan Air Force? Am I an innocent Indian fisherman? 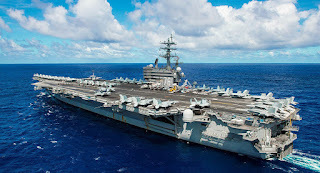 Are you the Srilankan cruel Navy? Am I Indian Indra Radar? Are you the plan of Tamil Tiger? 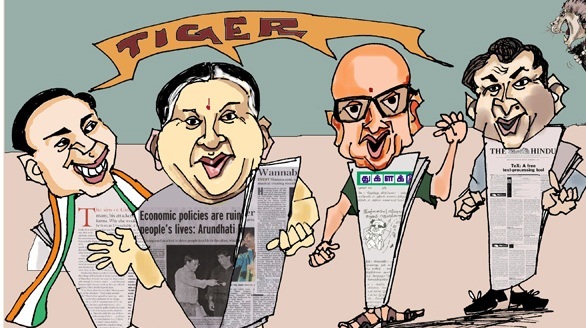 Am I the Liberation Tigers of Tamil Eelam? Are you Pakistan or Red China? Am I freedom fighting movement? Are you the Unites States of America? Am I the Tamils of Eelam? Are you the Indian government?